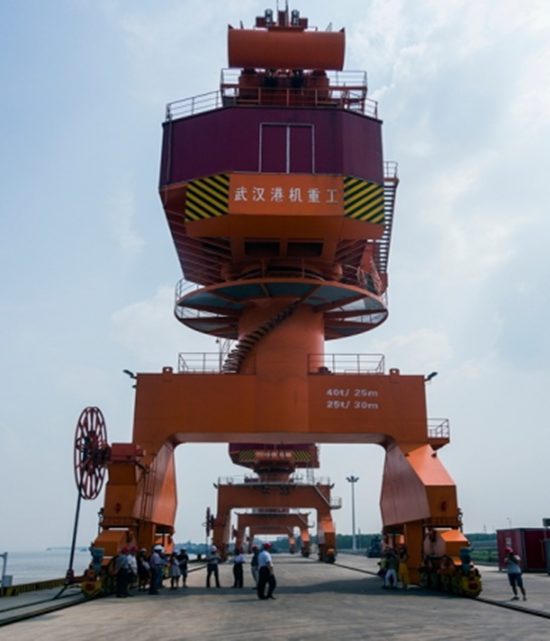 The Port Logistics Park of the Wuhan Economic and Technological Development Zone (WHDZ), Hubei province, is a deputy bureau-level agency of the WHDZ approved by the Wuhan municipal Party committee in 2015. Wuhan New Port planned a port logistics area of 50 square kilometers in the WHDZ, while the WHDZ has implemented 14.12 square kilometers in its short- and middle-range plans. Dengnan port logistics area covers 9.63 square kilometers and its coastline, including the Dengnan operating zone of Hannan port area, extends 15 kilometers. It now has three 30 million-ton common use berths and one commodity auto roll-on/roll-off one. The area's current annual auto roll-on/roll-off volume is 150,000 while the annual throughput capacity is 2 million tons. Shamao and Junshan port logistics areas cover 4.49 square kilometers with a coastline of about 5 kilometers (including the Shamao operating zone of Hannan port area). They now have six common use berths with an annual throughput capacity of 7 million tons. Meanwhile, the annual roll-on/roll-off capacity of its commodity auto roll-on/roll-off berth is 150,000. Dunkou port area covers 3.94 square kilometers. 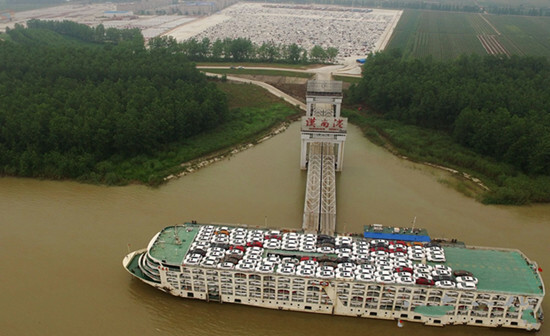 It has eight common use berths and 1 commodity auto roll-on/roll-off berth. It can roll on/off 200,000 vehicles per year and its annual throughput capacity is 3 million tons. The port logistics park plans to build 85 berths from 2016 to 2030, with 78 of them for common use and seven for commodity auto roll-on/roll-off. The annual throughput capacity is planned to be 100 million tons and the commodity auto roll-on/roll-off volume is targeted at 2 million plus 3 million containers. The WHDZ is located in the central part of China's integrated market and the southwest of the Wuhan Yangtze River axis economic corridor. As a result, it utilizes both the science and technology of East China and the resources and markets of central and West China. The port logistics park mapped out by the WHDZ is close to the west section of Yangtze River's midstream, with an area of 49.84 square kilometers. The coastline within the park's jurisdiction is 62.95 kilometers, 26.69 percent of Wuhan's whole coastline along the Yangtze River, which is 235.9 kilometers long. The port's coastline is 35.4 kilometers in total, 29.92 percent of Wuhan's 118.33-kilometer port coastline; 5.62 kilometers are in use. It has the best deepwater port coastline at the upstream of the Yangtze River in Wuhan, and is navigable by 5000-ton vessels throughout the year. After Hannan zone mandated the WHDZ for integrated development, the speed and mass of economic development were further accelerated. The WHDZ's port logistics volume is estimated to be 65 million tons, with containers of 1 million TEU. Meanwhile, industry in the surrounding area of the WHDZ is relatively developed. The wide and mature market provides strong support for the port area's leapfrog development. To date, the multi-functional comprehensive area in the zone, with focus on the auto industry including parts and electronics, is expected to have a capacity of 2.62 million by the end of 2017. The industrial enterprises above designated scale in the electronics industry are estimated to achieve total output value of 100 billion yuan. By the end of 2020, the port logistics volume in the zone should be 65 million tons. However, the port's logistics throughput capacity is currently only 20 million tons, resulting in increased logistic costs to enterprises in the zone. In 2016, WHDZ officially launched the update from an export processing zone to a comprehensive free trade zone, as approved by the provincial entry-exit inspection and quarantine bureau. With an investment of 5.15 billion yuan from Wuhan Trading Container Terminal Co Ltd, the project is divided into A and B regions. It has built seven 5000-ton container berths and two commodity auto roll-on/roll-off berths, with throughput of 1.4 million TEU container and 300,000 autos. Beijing Changjiu Logistics Co Ltd spent 3.09 billion yuan for Wuhan automotive logistics multimodal transport base construction. The project's construction includes four commodity auto roll-on/roll-off berths and a smart logistics trade hall and auto parts warehouse, as well as other supporting services for port transportation. Meanwhile, it plans to purchase eight auto roll-on/roll-off carriers, 1,800 car carriers and 60 flying-wing auto part delivery vehicles. The project would have a throughput capacity of 770,000 completed vehicles, as well as business in water transportation, vehicle storage and distribution, auto parts and supply chain financial services. Shengze Jietong Supply Chain Co Ltd will manage the project and China Zheng Tong Auto Services Holdings Limited is the project's investment investor. It plans to invest 1.5 billion yuan for construction of 4 port berths and three-dimensional multi-layer smart vehicle and parts storage, as well as supporting facilities for working and living.